Dimensions 468'10" by 40'5" by 13'1"
The Tenryus were completed in 1919 in Navy yards following careful study of the British Caledons. They were Japan's first modern light cruisers and established the precedent of designing such as destroyer flotilla leaders. Their machinery even consisted of three sets of destroyer turbines. Succeeding classes of light cruisers closely followed their pattern. 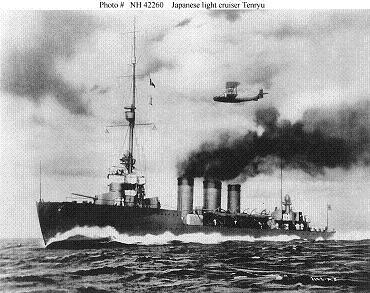 However, the Tenryus were rapidly outclassed by the very destroyers they were intended to lead. Their protection was inadequate, being designed only against 4" (102mm) U.S. destroyer shells, and their range was inadequate for Pacific service. Two of their boilers were of mixed design, capable of burning either oil or coal. The ships cost ¥4,550,000 apiece.